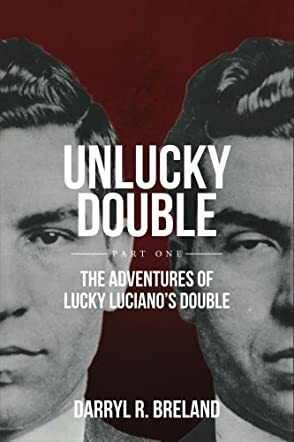 Unlucky Double: Part One (Volume 1) by Darryl R. Breland is subtitled Mafia, Nazis and Time Travel and it lives up to the description. It begins in the year 2046, where Giovanni “Johnny” Cado, a 20th-century New Orleans gangster who was just mysteriously found alive, not a day older than he had been in 1945, is being interrogated by the authorities. He begins to tell of his life — and he certainly had a colorful one. Growing up in the French Quarter and doing petty crimes, he eventually is recruited by the local Mafia bosses with an “offer he can’t refuse.” When some high-ranking New York mobsters discover that he is a dead ringer for Lucky Luciano, they give him several jobs in which he has to impersonate the mob boss. He grows to hate the New York gangsters and, on an assignment in Italy, he impulsively steals the mob’s money. He flees to Paris with his wife and establishes a new identity. Unfortunately for him, it’s 1940, and he soon finds himself working for the greatest gangster of all time, Adolf Hitler! Very few writers could bring together such disparate elements successfully, but Breland can. Unlucky Double: Part One is good historical fiction. It teaches readers things they might not know — for example, most Americans are familiar with the Mafia in New York and Chicago (Al Capone makes an appearance in the book), but not with its New Orleans counterpart. "Silver Dollar Sam," a major character in the New Orleans portion of the book, was a real mob boss. Breland’s writing style is excellent, and superfluous material is rare and doesn’t interfere with the action. Unlucky Double: Part One ends with a teaser for Part Two, and I can’t wait to see how that turns out – and how Johnny ends up in 2046.